Rothosen fans, now you can gear up for the Bundesliga 09/10 matches at the HSH Nordbank Arena with your Hamburg 09/10 Home Soccer Jersey! 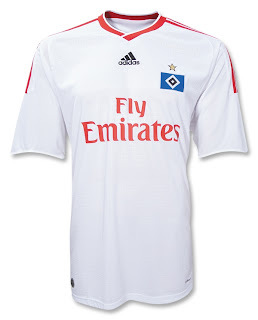 The Official Hamburger Sport-Verein Home Short Sleeve Soccer Jersey from adidas is white with a redesigned collar, and signature adidas stripes over shoulders, embroidered team badge with championship star embroidered over heart and adidas logo at center with heat pressed Fly Emirates sponsor logo. And yes, it's made with ClimaCool® - advanced material engineered to reduce heat and moisture build-up, allowing increased comfort and performance – to keep you feeling fresh no matter how long the big Rothosen match goes on.